It was in the mid-50s and windy in the high desert. We got about two inches of rain a week ago so I figured it would be a good time to head out to some dry lake beds to see if I might find a meteorite. This trip I decided to head up to Superior Dry Lake. 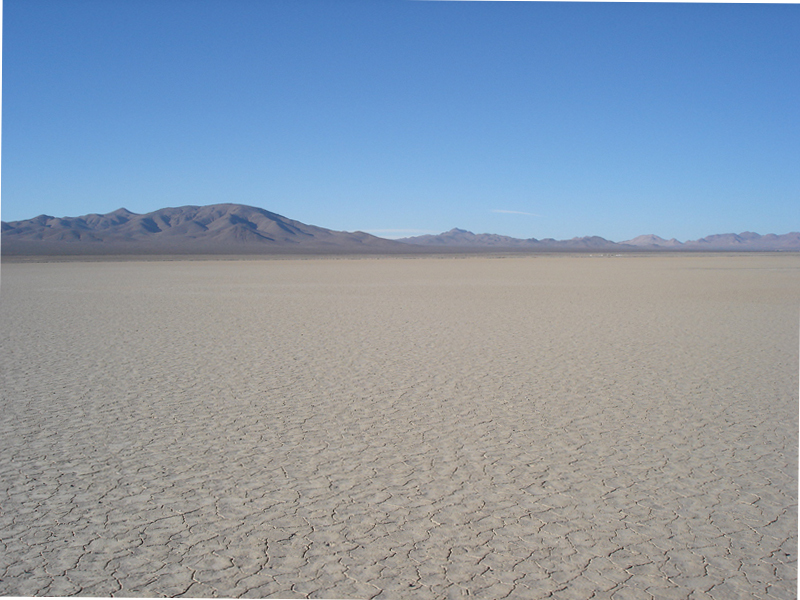 Superior Dry Lake sits at almost exactly 3000' above sea level, south of Superior Valley, and north of the Black Mountains Wilderness in the western Mojave. There were some interesting swirling cloud formations above me as I headed north into the desert. On my way through Barstow I caught the sign for the Desert Discovery Center, home of the 2nd largest meteorite discovered in the USA. I made a quick u-turn and went in to check it out. The Old Woman meteorite, minus 900 or so pounds that resides in the Smithsonian. It's pretty cool that you are able to touch this thing. There's a bunch of magnets stuck to it. Head north out of Barstow and eventually the pavement ends. These BLM roads are well maintained and the scenery is fantastic. After cresting a hill I can see Superior Dry Lake to the north. There are actually 3 separate dry lake beds that make up Superior Dry Lake. I had spent some time researching and planned to search the "shore" of the middle dry lake and the north side of the eastern dry lake. The road I was on lead straight to the eastern dry lake bed. Unfortunately the limits of the China Lakes Naval Weapons Center shown on my 1997 BLM quad map were out dated and the road was gated about 2.6 miles south of the dry lake. The middle dry lake and the eastern dry lake were now surrounded by barbed wire fence and completely off limits. There went my plans! Didn't I just see this on an episode of Meteorite Men? I decided to head west along the fence frontage road and make my way toward the western dry lake bed. First I stopped at Location #1, it looked like good terrain to hunt. I had been driving for a while now; it was time to get out and find some rocks. There are some volcanic formations in the area, so there are a lot of black and dark purple-ish rocks, some mildly magnetic, some with a nice finish to them that almost fool you, and some that look like the real thing at first, but after a few minutes you learn to ignore all the wrongs and tune into the more rusty shades and look for rusty fractured surfaces (like meteorite Superior Valley 002). Location #1 had a lot of these things which I think held bullets at one point in time. Lenticular clouds hovered like UFOs over the mountains around me. After about an hour I decided that Location #1 would be a good spot to come back to another day. I had never been to this part of the Mojave so I wanted to use the day to check out as many spots as I could. I got back in my truck and headed to Location #2. There were a lot less volcanic rocks here, and the ground had a much more glassy look to it. The wind was really blowing now, I was glad I brought two jackets. The west bed of Superior Dry Lake was just ahead. This appeared to be an old excavation. There was another weathered pile of dirt to the right. Probably a military thing. I left Location #2 and headed out to Superior Dry Lake. The west bed is the largest at 2.6 by 1.5 miles. It really plays with your eyes to stand on it, as it appears to go from horizon to horizon. 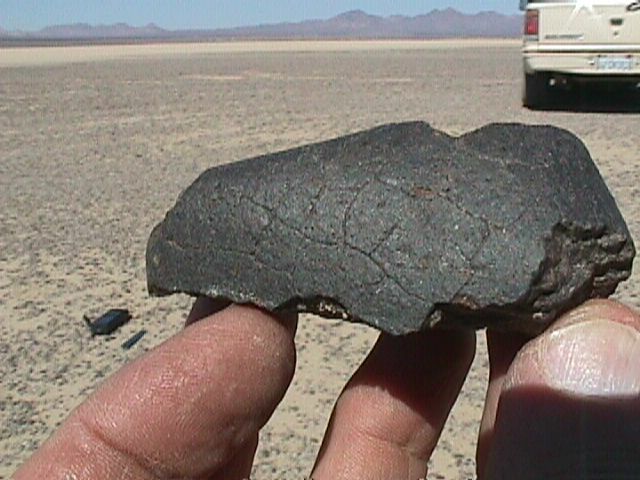 There are quite a few fist-sized black volcanic rocks on the surface that make hunting here a bit difficult. Too bad the one bed I didn't create any gps coordinates for was the only one I could hunt. I decided to come back to this area again another day with a better plan. On my way in I had spotted what looked to be a dry lake surface to the northeast of the road. 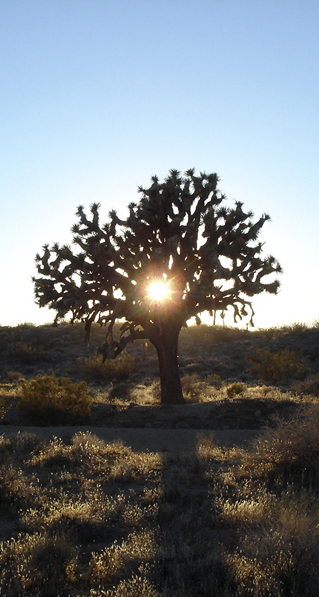 Being this is desert tortoise habitat you are only allowed to drive on BLM designated routes. My gps shows BLM trails, so I figured out a different route back toward where I though I had seen the sandy colored terrain earlier in the day. I came around a hill and there it was, a grassy field. From a distance it looked like dried mud. I didn't find any meteorites, but I got some good intel on some places to come back to. 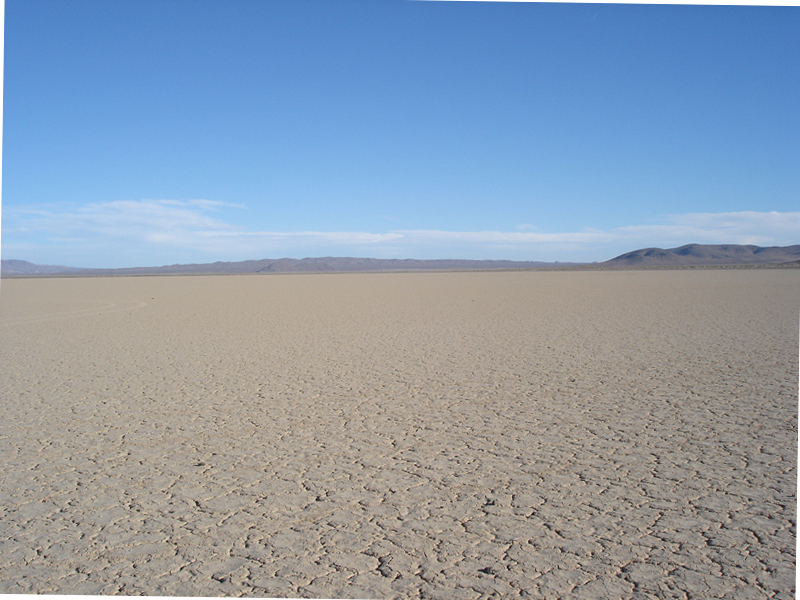 Only a few stones have been found on the western dry lake bed, the majority were found on the south shore of the eastern bed. Too bad that one is fenced off now. The most interesting thing I found all day was this WWII-era 50 caliber bullet tip.